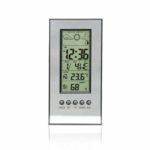 Mini thermometer hygrometer with large LCD display, an excellent device to display temperature, humidity and time simultaneously. Perfect for baby room, guitar room, bedroom, camping tent, etc. 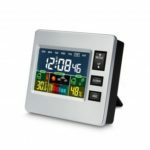 It&apos;s suitable for offering you a digital and better living condition to keep healthy. 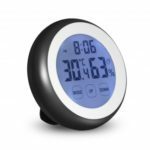 2 in 1 thermometer + hygrometer, a perfect household device helps you keep your family&apos;s living conditions optimal. 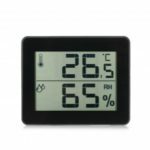 Large LCD display shows real-time temperature and humidity with ℃/℉ temperature units for selection. 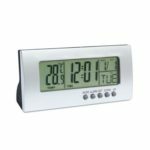 Wide temperature range (-50～70℃) and humidity range (10～99%) with 12/24H format and alarm clock function. 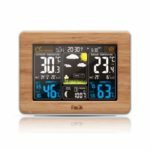 Record max/min indoor temperature and humidity, can display time, year and date. Cute humidity level icons: smiling face(comfortable) or crying face(too dry or too wet) enable people to know the air conditions more easily. With a folding bracket and a hanging hole, you can place it on the table or hang it on wall. Perfect for living room, balcony, greenhouse, baby room, bedroom, storage room, garden, camping tent and so on.